Instead of posting a suggestion in the forum I wanted to try to change a couple of things by myself but the Debug App and Release App don't seem to work. 'ReShade64.exe' (Win32): Loaded 'F:\GitHub\reshade\bin\x64\Debug App\ReShade64.exe'. Symbols loaded. 'ReShade64.exe' (Win32): Loaded 'C:\Windows\System32\ntdll.dll'. Cannot find or open the PDB file. 'ReShade64.exe' (Win32): Loaded 'C:\Windows\System32\kernel32.dll'. Cannot find or open the PDB file. 'ReShade64.exe' (Win32): Loaded 'C:\Windows\System32\KernelBase.dll'. Cannot find or open the PDB file. 'ReShade64.exe' (Win32): Loaded 'C:\Windows\System32\user32.dll'. Cannot find or open the PDB file. 'ReShade64.exe' (Win32): Loaded 'C:\Windows\System32\win32u.dll'. Cannot find or open the PDB file. 'ReShade64.exe' (Win32): Loaded 'C:\Windows\System32\gdi32.dll'. Cannot find or open the PDB file. 'ReShade64.exe' (Win32): Loaded 'C:\Windows\System32\gdi32full.dll'. Cannot find or open the PDB file. 'ReShade64.exe' (Win32): Loaded 'C:\Windows\System32\msvcp_win.dll'. Cannot find or open the PDB file. 'ReShade64.exe' (Win32): Loaded 'C:\Windows\System32\ucrtbase.dll'. Cannot find or open the PDB file. 'ReShade64.exe' (Win32): Loaded 'C:\Windows\System32\ole32.dll'. Cannot find or open the PDB file. 'ReShade64.exe' (Win32): Loaded 'C:\Windows\System32\combase.dll'. Cannot find or open the PDB file. 'ReShade64.exe' (Win32): Loaded 'C:\Windows\System32\rpcrt4.dll'. Cannot find or open the PDB file. 'ReShade64.exe' (Win32): Loaded 'C:\Windows\System32\bcryptprimitives.dll'. Cannot find or open the PDB file. 'ReShade64.exe' (Win32): Loaded 'C:\Windows\System32\sechost.dll'. Cannot find or open the PDB file. 'ReShade64.exe' (Win32): Loaded 'C:\Windows\System32\msvcp140d.dll'. Cannot find or open the PDB file. 'ReShade64.exe' (Win32): Loaded 'C:\Windows\System32\vcruntime140d.dll'. Cannot find or open the PDB file. 'ReShade64.exe' (Win32): Loaded 'C:\Windows\System32\ucrtbased.dll'. Cannot find or open the PDB file. 'ReShade64.exe' (Win32): Loaded 'C:\Windows\System32\imm32.dll'. Cannot find or open the PDB file. 'ReShade64.exe' (Win32): Loaded 'C:\Windows\System32\uxtheme.dll'. Cannot find or open the PDB file. 'ReShade64.exe' (Win32): Loaded 'C:\Windows\System32\msvcrt.dll'. Cannot find or open the PDB file. 'ReShade64.exe' (Win32): Loaded 'C:\Windows\System32\msctf.dll'. Cannot find or open the PDB file. 'ReShade64.exe' (Win32): Loaded 'C:\Windows\System32\oleaut32.dll'. Cannot find or open the PDB file. 'ReShade64.exe' (Win32): Loaded 'C:\Program Files (x86)\RivaTuner Statistics Server\RTSSHooks64.dll'. Module was built without symbols. 'ReShade64.exe' (Win32): Loaded 'C:\Windows\System32\shlwapi.dll'. Cannot find or open the PDB file. 'ReShade64.exe' (Win32): Loaded 'C:\Windows\System32\winmm.dll'. Cannot find or open the PDB file. 'ReShade64.exe' (Win32): Loaded 'C:\Windows\System32\winmmbase.dll'. Cannot find or open the PDB file. 'ReShade64.exe' (Win32): Loaded 'C:\Windows\System32\cfgmgr32.dll'. Cannot find or open the PDB file. 'ReShade64.exe' (Win32): Loaded 'C:\Windows\System32\dwmapi.dll'. Cannot find or open the PDB file. 'ReShade64.exe' (Win32): Loaded 'C:\Windows\System32\kernel.appcore.dll'. Cannot find or open the PDB file. 'ReShade64.exe' (Win32): Loaded 'C:\Windows\System32\TextInputFramework.dll'. Cannot find or open the PDB file. 'ReShade64.exe' (Win32): Loaded 'C:\Windows\System32\CoreMessaging.dll'. Cannot find or open the PDB file. 'ReShade64.exe' (Win32): Loaded 'C:\Windows\System32\CoreUIComponents.dll'. Cannot find or open the PDB file. 'ReShade64.exe' (Win32): Loaded 'C:\Windows\System32\SHCore.dll'. Cannot find or open the PDB file. 'ReShade64.exe' (Win32): Loaded 'C:\Windows\System32\ntmarta.dll'. Cannot find or open the PDB file. 'ReShade64.exe' (Win32): Loaded 'C:\Windows\System32\WinTypes.dll'. Cannot find or open the PDB file. 'ReShade64.exe' (Win32): Loaded 'C:\Windows\System32\advapi32.dll'. Cannot find or open the PDB file. The thread 0x3360 has exited with code 1 (0x1). The thread 0x2508 has exited with code 1 (0x1). The thread 0x1930 has exited with code 1 (0x1). The program ' ReShade64.exe' has exited with code 1 (0x1). Any ideas what I can do to make them work? I use Windows 10 Pro N 64-Bit-Version. Using the self-compiled ReShade.dll in a game works fine btw. Last Edit: 4 months 1 week ago by Daodan. How about to turning off to RivaTuner Statistics Server? Thanks for the suggestion but sadly that doesn't solve the problem. The entry for RivaTuner Statistics Server disappears in the output and the debug app still exits with code 1. And the release app still throws an exception. Otherwise it won't do anything and exit with code 1 right away. 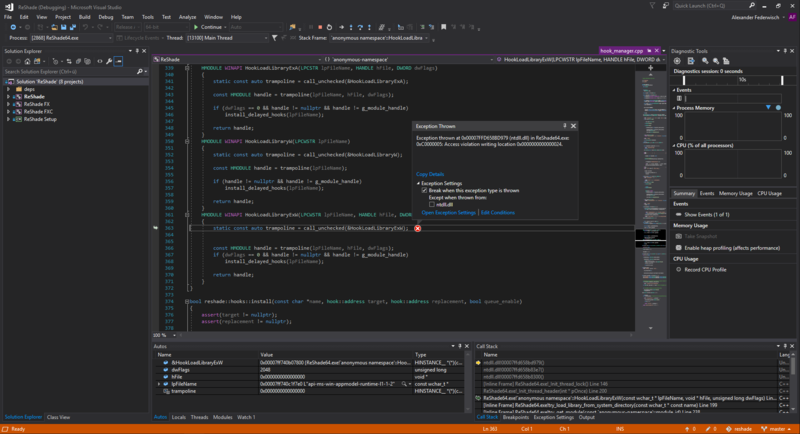 Visual Studio has an option in the debugging section of the project properties to set command-line arguments. Thanks. Not having the argument set was the issue. It works now.